Greetings, dear readers! I've been trying to get back to my normal routine after the trip to Polish Con New York this past weekend, and I'll have my post up on it soon. Until then, I have a fabulous set of neon polishes to share with you this afternoon. Let's jump in! Lyn B Designs is going to be launching her new Neon Dream Collection on Friday, and I'm so excited to be sharing them with you! Jenna, the creative mastermind behind the brand, has a knack of taking neon polishes and making them special. 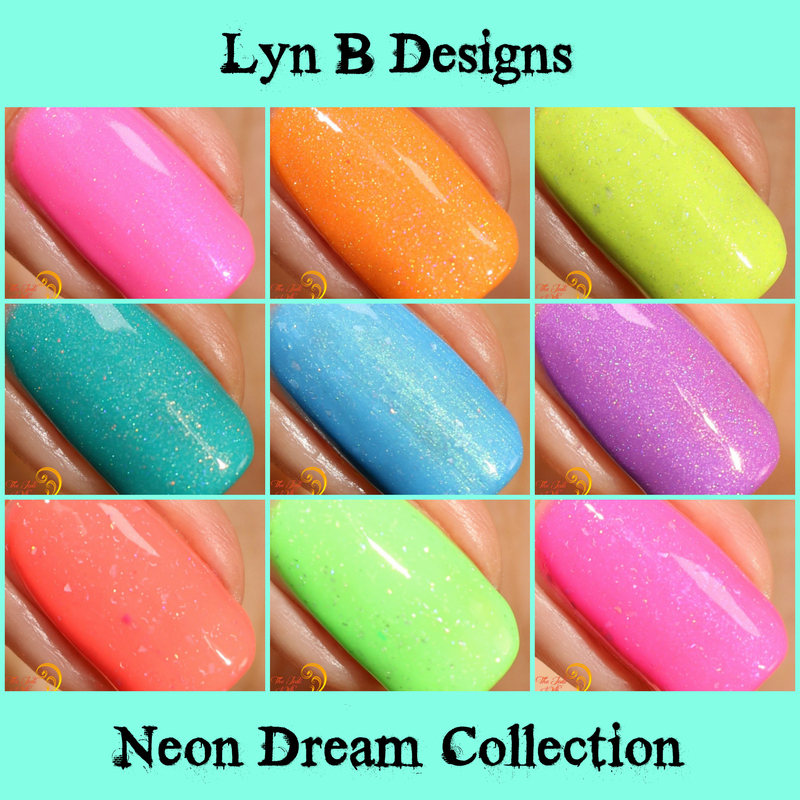 Last year she released the Staycation Collection, a set of pastel neons, and I am happy to see another Lyn B Designs neon collection launching this summer. Before I get to rambling any longer, let's check them out! All swatches are shown with the addition of HK Girl top coot from Glisten & Glow. I love a good neon pink polish, and I love the addition of the holographic pigment and purple shimmer in In the Pink! The formula was easy to work with as well. There was a little bit of undissolved pigment, but the issue has since been resolved by Jenna. 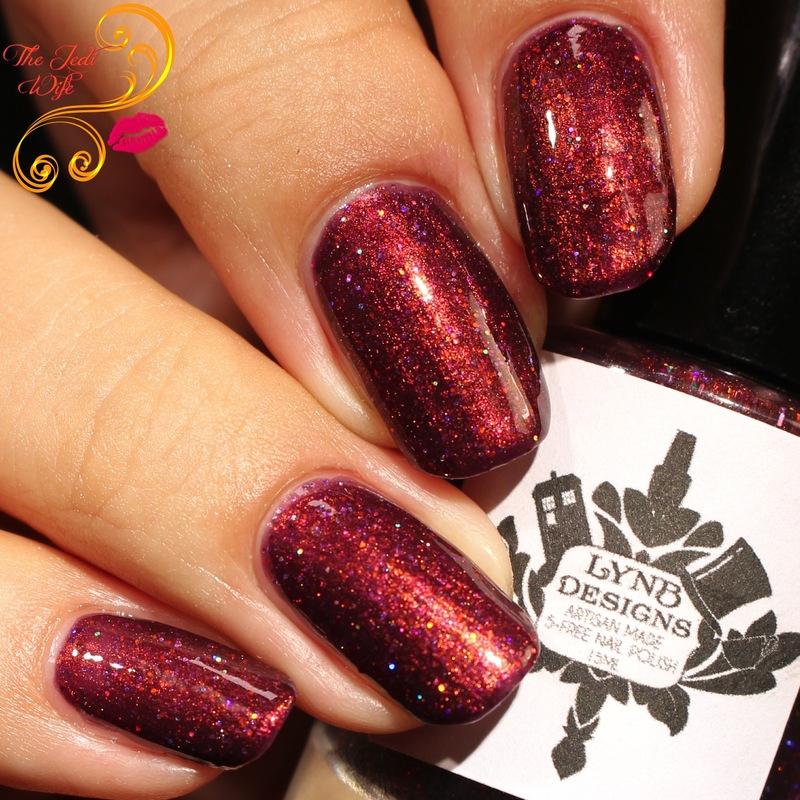 This particular pigment was used in several of the polishes in this collection so it is an issue you'll see mentioned again in this post. This is such a pretty shade of orange! As much as I love orange, I'm not overly fond of them as a neon. Cosmic Orange is bright but has the perfect amount of softness to keep it from being "too" bright. This is another shade that included the undissolved pigment, but the issue has since been resolved. How awesome is this polish! I was a little unsure of this with the holo flake, but I just love the look of this polish! The formula was really easy to work with as well, and Searing Lemon is one of my "must haves" from the collection! While there are several lovely colours in this collection, Electric Teal is arguably my favorite. I just love this shade! Not only is the colour stunning, the formula was so smooth and easy to work with. Liquid Blue is such a pretty shade of blue and the flakes add such a pretty touch! I did find the flakes occasionally dragged into the base polish so you do need to apply this in slightly thicker coats for a smoother finish. Derpy Coral is such a fun colour, from the base shade being perfect to the addition of the holographic pigment and the scattering of flakes that add something fun. This applied easily in spite of the pigment issues, and I think it's going to be a hot polish this summer now that the pigment issues have been resolved. This is such a great shade of green and the holographic flake adds such a fun sparkle! The formula was easy to work with as well! I love this polish, from the flakes to the pops of aqua from the shimmer! This was easy to work with in spite of some pigment issues, and I'm so glad the problem has been resolved for future batches! Magenta Flash is another "must have" shade from the collection for me, although they're all stunning and you can't go wrong with any of them! The Neon Dream Collection is releasing May 5th at 7pm EST on the Lyn B Designs website. The full collection will be $80 and includes free shipping within the US. 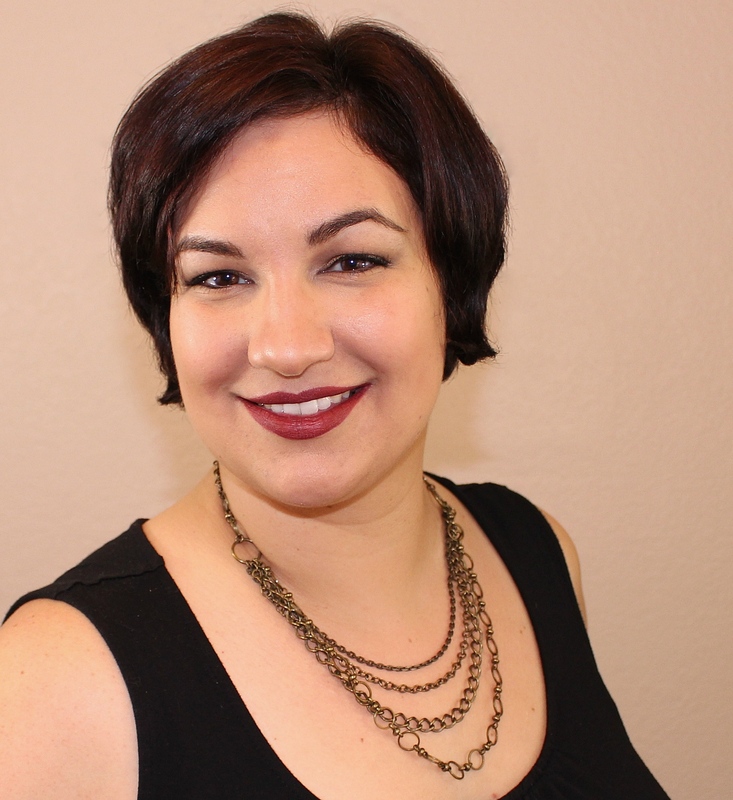 To celebrate the launch, Jenna is offering a 50% discount with discount code DREAM through May 12th. In addition to the Neon Dream Collection, there are two polishes of the month being released for May. Let's check them out! I am so glad to see the return of this polish as a Polish of the Month! 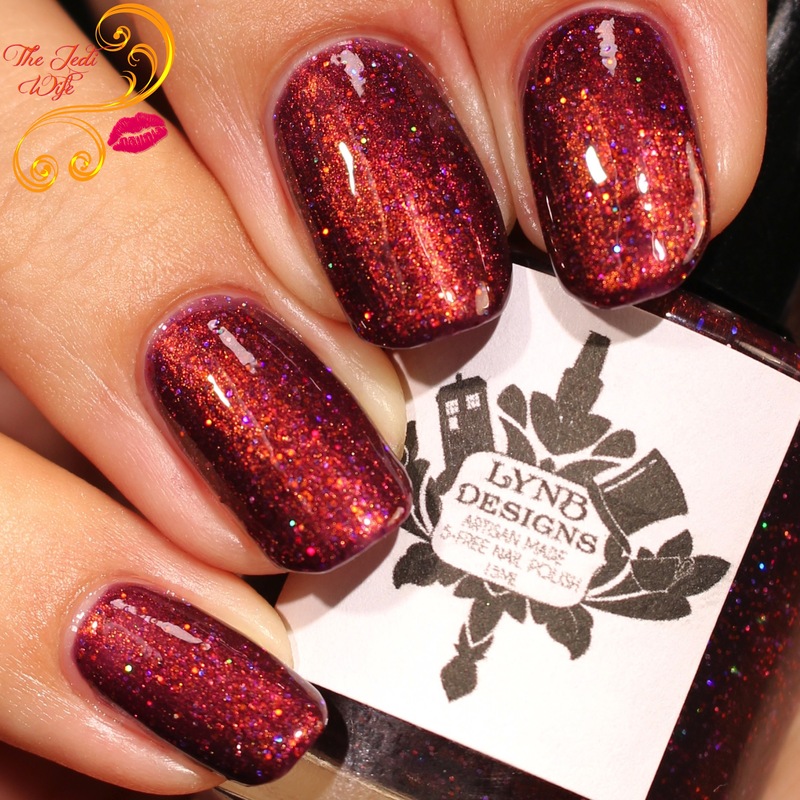 The purple base paired with the copper is perfection, and This is Halloween is one of my all-time favorite Lyn B Designs shades. The formula was on point as well. A sky blue crelly base with linear holographic particles and subtle shift from green to pink to yellow. Flourish is a stunning colour and a great formula to boot! Anyone that likes light blue polishes is going to want to add this beauty to their collections! This is Halloween and Flourish will also be launching on May 5th at 7pm EST on the Lyn B Designs website alongside the Neon Dream Collection. Don't forget to use discount code DREAM to save 50% on your purchase through May 12th. Do you have a favorite shade from the Neon Dream Collection? Are you planning to pick up one of the May polishes of the month? I'd love to hear from you! I'm loving that she jazzed up her neon collection this year! I have a love/hate relationship with neons. SOme of them look good on me, and some look absolutely horrible. Flourish is absolutely stunning though! Cosmic Orange looks RAD especially on your background! These are ALL amazing but I NEED Searing Lemon!!! I'm loving this collection. That coral! I need Electric Teal NOW!!!!! They're so bright and pretty!